For more great AtoZ Challenge blogs, click here. 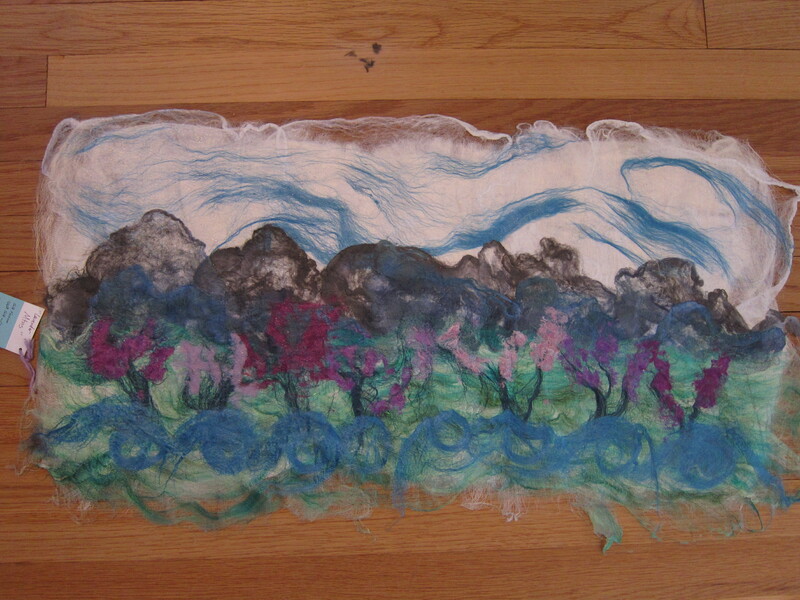 Sequim Lavender Festival, Fabric/Fiber Art by Lauralee DeLuca of Phoenixx Fibers. We weren’t trying to follow our noses, but in the summer of 2011, we visited San Juan Island for a few days. We were living in Houston at the time, and we visited the Pacific Northwest so my husband could participate in the RAMROD (Ride Around Mount Rainier in One Day). I don’t ride. I’m happy to be a cheerleader. Anyway, after the ride we visited San Juan Island for some R&R. While there, we toured the Pelindaba Lavender Farm, and I scarfed up plenty of souvenirs: lavender teas, lavender room freshener, culinary lavender, and, of course, lavender chocolate. Lavender is a calming herb, and I need all the help I can get. We had left a record hot and drought-filled summer in Houston that destroyed not only my vegetable garden, but some of my native plants as well. Apparently even heat-loving plants have their limits. On the island, we sat in restaurants with doors open and fresh air pouring in. I wasn’t drenched with sweat the moment I walked outdoors, and our tour of the lavender farm was relaxed. We could take our time without dying of sunstroke. Shortly after our return, we had had enough. Henry’s parents had both died. The kids had their own lives, one in New York and the other in Dallas (later, Miami). We both work from home. What were we doing here? While we felt Port Townsend was a better overall fit than San Juan Island, we knew we belonged in the Pacific Northwest. These days, I have a yard filled with lavender, a great treat for the bees as well as me. 45 minutes down the road, the town of Sequim offers an annual lavender festival, and I even have a fabric art piece that honors Sequim’s purple summer beauty. A scent, a whiff, and presto! A cross-country move. Thanks, lavender. Oh, that’s so sad that your husband can’t enjoy lavender. Thanks for visiting. The organization of this blog challenge is impressive. I like the looks of lavender but I’m sensitive to scents, so lavender and I look at one another from afar. I’m glad that the lavender convinced you to move to the NW. Port Townsend is a wonderful town. Now, do your deer munch on the lavender too? Hopefully, your garden will survive while you are gone. Lovely post. The deer leave the lavender alone, thankfully, and we’ve fenced in everything we want to keep them away from. I did a lot of work in the garden before we took off, and I’m hopeful it will be in good shape when we get home. Right now I’m more worried about the slugs! 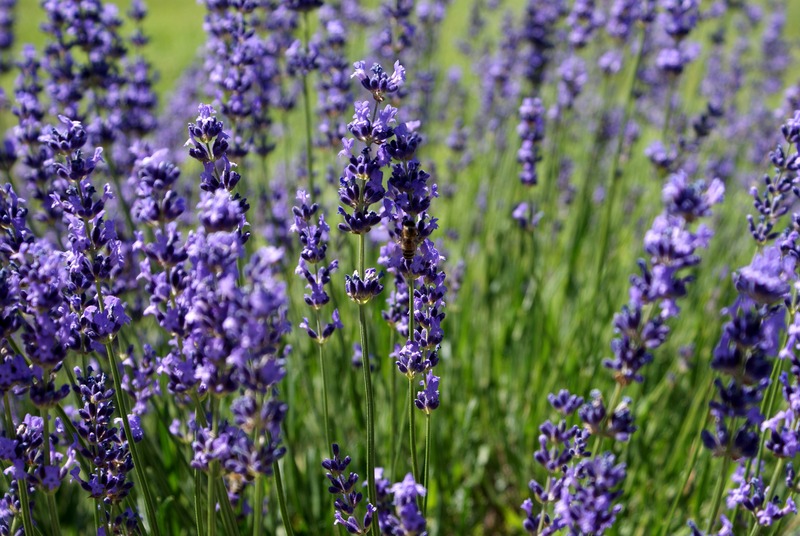 A lavender festival sounds like a delightful event! We actually skip the festival, because we can drive to the lavender fields at any time when they’re in full bloom…one of the advantages of living here, that we can avoid the crowds. I think I know the drought year you speak of in Houston. I live about two hours away and we had a summer where everything in the yard turned brown and started to go crunch when you walked cross it. Dust would powder up anytime anything took a step. It was awful. I love the scent of lavender, but I’ve never tried to raise it. Yeah, that sounds like the one! We visited Houston once after we left for a family event (my husband’s sister still lives there), and Memorial Park looked devastated. So many trees died in that drought.